Where Are Your Shoe Boxes Going? 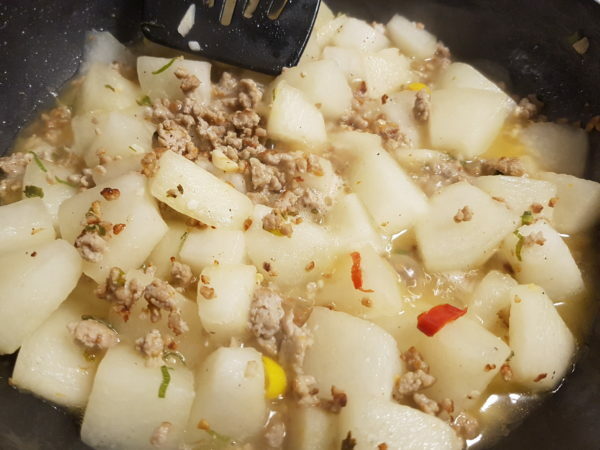 Winter Melon with Minced Pork is another simple and easy to make recipe. When I bought 500g of lean ground pork to make Steamed Eggs with Minced Pork, I only used 1/2 of the stir fried minced pork. I used the other half of the stir fried minced pork for the Winter Melon with Minced Pork recipe. 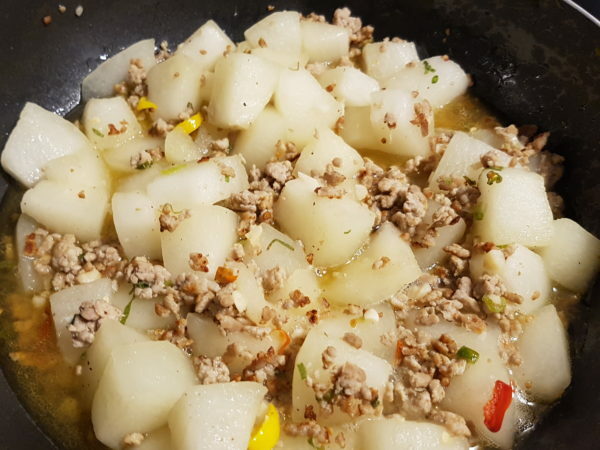 Winter Melon with Minced Pork is another comforting home-made food, yet so savory and contains proteins. 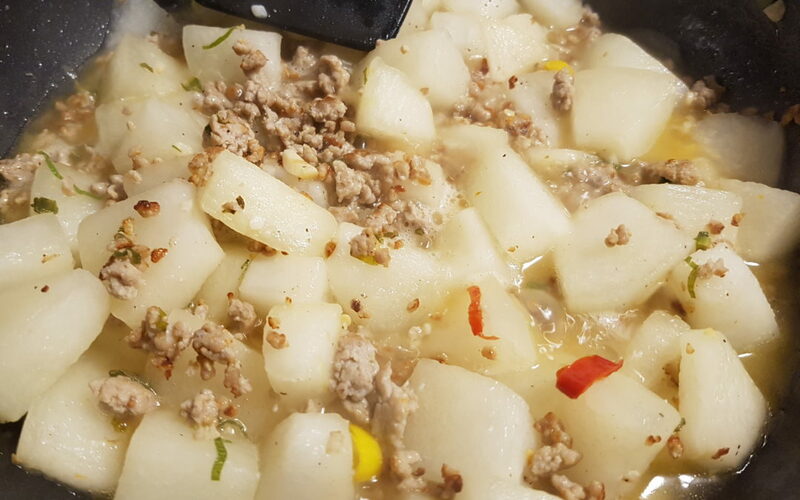 You serve the winter melon with minced pork with steamed rice. Contains High levels of potassium and vitamin C. This protects the Heart. Check out the details of the benefits of a winter melon from Lybrate. Winter Melon can be grown in your backyard in the summer. 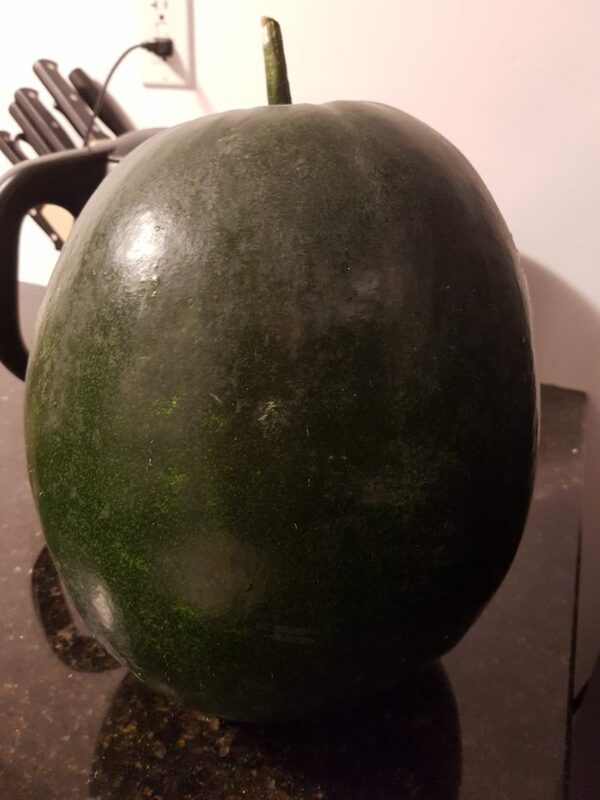 My Dad grew Winter Melon in the backyard every summer. You have to make a garden bed for the winter melon vines to climb on. Every summer, my Dad has at least 5-6 winter melons to harvest. Here’s one of the organic winter melon that my Dad gave me and I used it in this Winter Melon with Minced Pork recipe. Winter Melon can also be bought in any Chinese grocery store. The price of winter melon is really cheap compared to any other types of vegetables. Cut the winter melon in half and remove the seed. To store it, put in a freezer bag. Store the extra winter melon for future use in the freezer. I marinated the minced pork with salt and pepper, garlic oil and chili pepper, wrapped the dish with saran wrap and left it in the refrigerator for a couple hours. The longer you marinate, the better the meat will taste. If you choose, you can marinate it and leave it in the fridge over night and cook it the next day. Add marinated minced pork and stir fry until the meat is fully cooked. 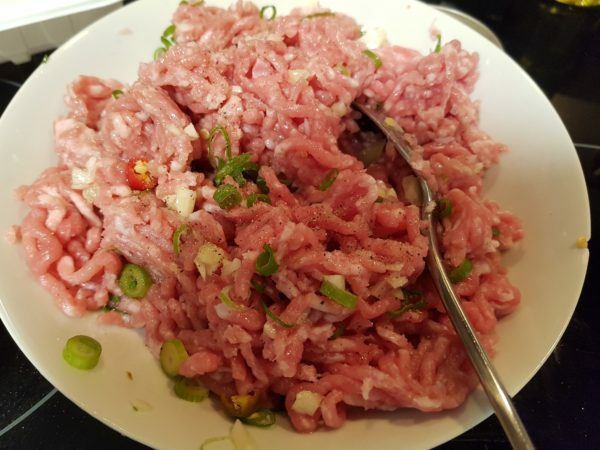 Removed cooked minced pork from heat. 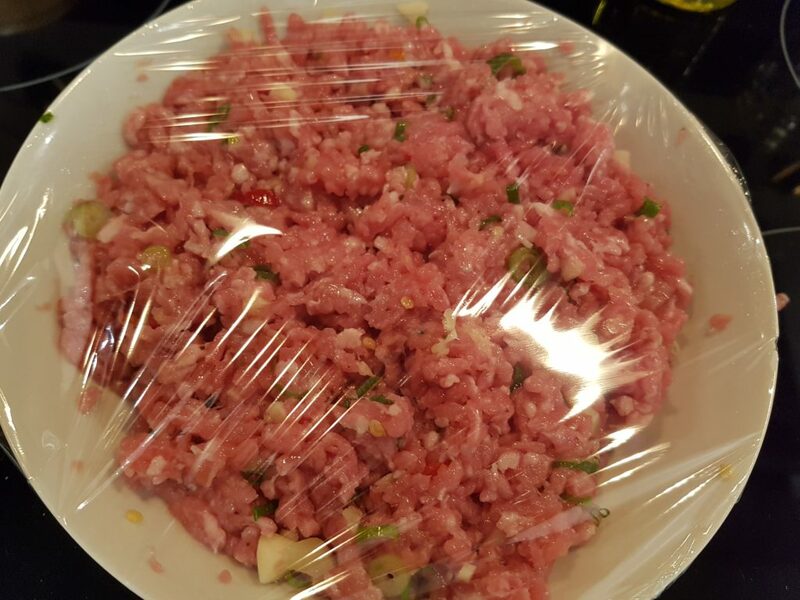 500g of mince pork is a lot. You only need 1/2 of the cooked minced pork. 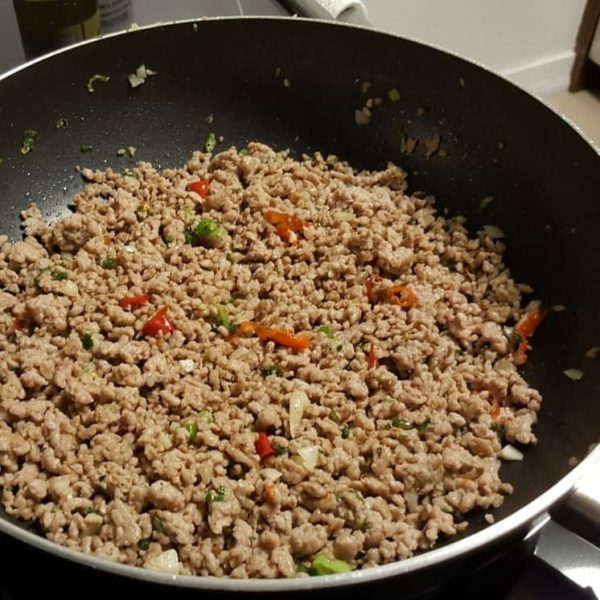 You can store the cooked minced pork in the refrigerator and make another dish in a day or two. I used the 500g of stir fried minced pork for this recipe in addition to the Steamed Eggs with Minced Pork recipe. 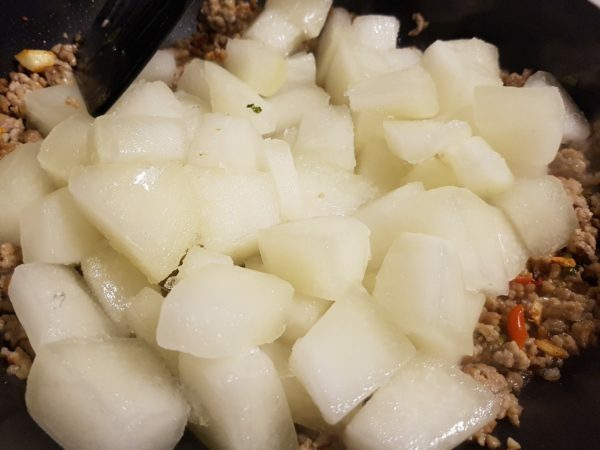 Enjoy the Winter Melon with Minced Pork on Steamed Rice. Note: Winter Melon’s flesh is white, it is quite tasteless, and it is never eaten raw. The melon has no distinct taste or flavor of its own. It will pick up the flavor of the stir fried minced pork. This makes the dish very light and tasty! Wrap the dish with saran wrap and left it in the refrigerator for a couple hours. The longer you marinate, the better the meat will taste. If you choose, you can marinate it and leave it in the fridge over night and cook it the next day. myrealifetips.com is a participant in the Amazon Services LLC Associates Program, an affiliate advertising program designed to provide a means for us to earn fees by linking to Amazon.ca, Amazon.com and affiliated sites.